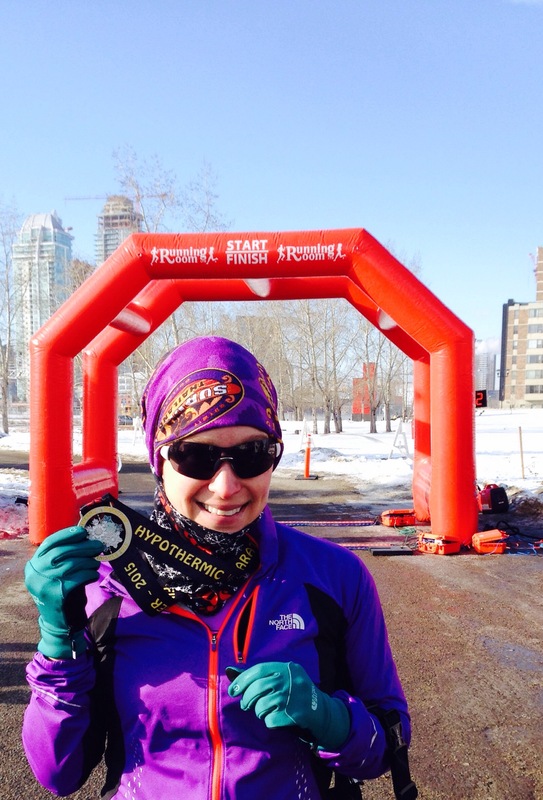 Calgary Hypothermic Half-My Muddled Post-Race Thoughts | Je Me Souviens-To Infinity & Beyond! 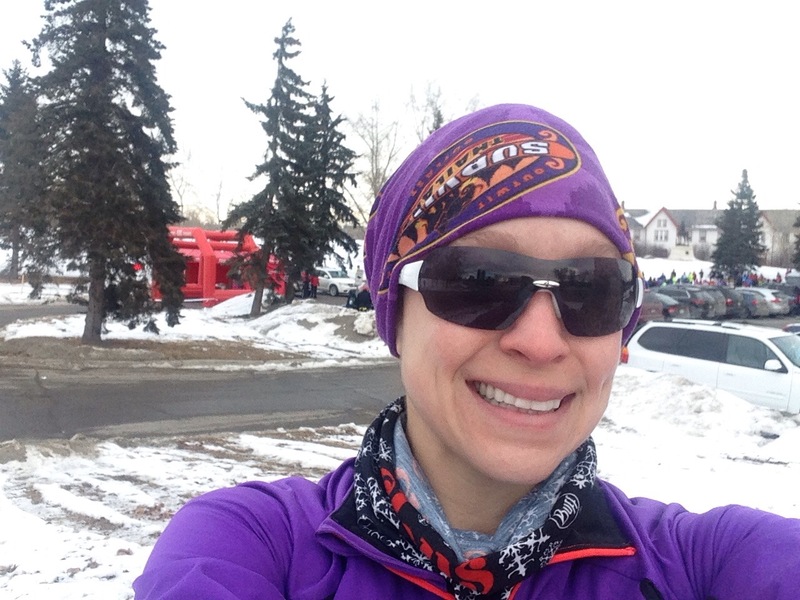 Running a February half marathon in Calgary, Alberta, is slightly crazy. But running one with the mindset of getting a personal best is slightly insane. But, that’s how I went into the 2015 Hypothermic Half Marathon. Go big or why do it, right? I signed up for the event in November, as I had wanted to find a chip-timed event for my Digital Running “Time of the Season” Challenge (a timed event every month from March 2014 through February 2015. This was the only event I could find somewhat in the area with official timing (other than a 50km!). I have gushed about my love of running Calgary before, as the routes are always pretty and I’ve had pretty consistent race success, so driving up for a quick weekend was something I had no issue with. I headed up to Calgary on Saturday afternoon for packet pickup at the Eau Claire Market Running Room. Pickup was easy and seamless-received my race bib, which had the timing chip right on the back, and the swag, which was a pair of winter running gloves and Running Room’s version of a Buff (neck/head warmer piece). All were very nice! The ladies at pickup were also very nice at explaining the map to me, which I had looked at online. I was somewhat familiar with the route, as I have ran parts of it on previous races but I wasn’t completely sure where the turns at the bridges would be (more in that later). My 7 am alarm came fast and I felt pretty lethargic. I was slow to move, but made it to Tim Horton’s to get my oatmeal and coffee for my breakfast and preparation rituals. I was staying at my friend Cindy’s house which is a two minute drive to a Tim’s, so I was able to go there and get back right away to get prepped. It was COLD out…colder than I thought it would be. I needed to layer correctly so I was warm enough….but not miserable. I hate feeling overheated. I also taped my knees and quads up, as those are always potential issues. 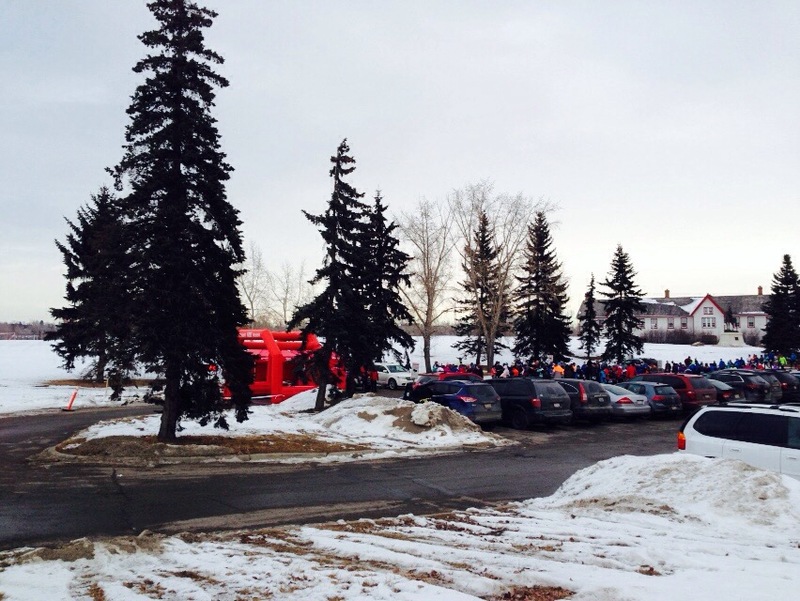 I headed out the door at 8:20 am to attempt and find my way to Fort Calgary for the race start. The biggest thing for any race of a half marathon or longer, for me personally, is getting in the pace groove. I had wanted to be hitting 7:25 minute mile paces or faster in order to potentially beat my September 2014 personal best time of 1:37:51. The first three miles were pretty well marked, had an occasional volunteer directing you, and was all located in the south side of the Bow River. I ran these in 7:14, 7:25 and 7:38, respectively. Because of this inconsistency, I honestly wasn’t that sure of myself at that 5km mark. I needed to get on track fast. The part of the course I was on now was familiar. I had been here before during Run for L’Arche last March. This “comfort zone” factor helped ease me down some. Also, since this is a public trail and local runners were out running, the random runners cheering us “racers” on as we passed was awesome! This helped push me to a 7:19, 7:26 and 7:18 mile 4-6. This brought me to the clearly marked turnaround, which if this had been a 10km race, I would have gotten a personal best. I was feeling strong, so I decided to get on trucking. Everyone else around me looked like they were freezing, but I was strangely feeling fine. It was about 10F outside and I kept alternating between having my buff covering my mouth to just my neck. So maybe I’m superhuman, I don’t know. I was grateful that I did have my running sunglasses on, though, just to protect from the bright morning sun and wind. With the paths being clear of ice and snow, I was able to keep my pace up during the tough miles of 7-10, where I ran a 7:21, 7:24, 7:25 and 7:25. Now looking at my GPS tracking after the race, I notice that mile 10 was approximately where we crossed over from the south side of the Bow River on the way out. I was in my own world by this point, but now it all makes sense because I didn’t recognize anything around me from that day (I recognized the road parallel to me from running on it during the Calgary Marathon, but that’s not what mattered). I knew that the last part of the course was going to be on the opposite side of the river as where we started, but I really wasn’t sure for how long. The last volunteer I saw said “go until the St. Patrick’s Bridge!” Well, that’s great, but I don’t live here and don’t know what that bridge is! That is my one complaint about this event-the lack of volunteers in the later part of the race. I asked every random runner/biker/walker/human I went past from mile 10 until the bridge where this bridge was. I was running with a little uncertainty the last 3 miles because I was nervous I would miss my turn and screw up my time! I did keep pushing because I knew I was on pace to break my personal best. I held up mile 11 and 12 in 7:21 and 7:24. I knew I had to give anything I had left in the fuel tank the last mile to see what I was made of. There was about 1/2 mile left when I turned on that final bridge and I was feeling awesome! I gave the photographer a smile and looked way ahead for the finish. It was a winding path, heading into the Fort a different way than we had came out. I felt the strongest I had ever felt coming into a half marathon, finishing my last mile in 7:03…..7:03! My official finish time was 1:35:41, good enough to best my personal best by 2 minutes and 10 seconds. I placed 1st out of 62 in my age group, 3rd out of 216 in females, and 17 out of 426 overall. And I did this all while running in a February road race in Calgary, Alberta. And it was COLD! I thrive on the cold, I really do! While I usually never want food immediately after finishing a race, I did today. Maybe the cold had a hunger effect on me, who knows. But let me tell you, I am glad I did want food. 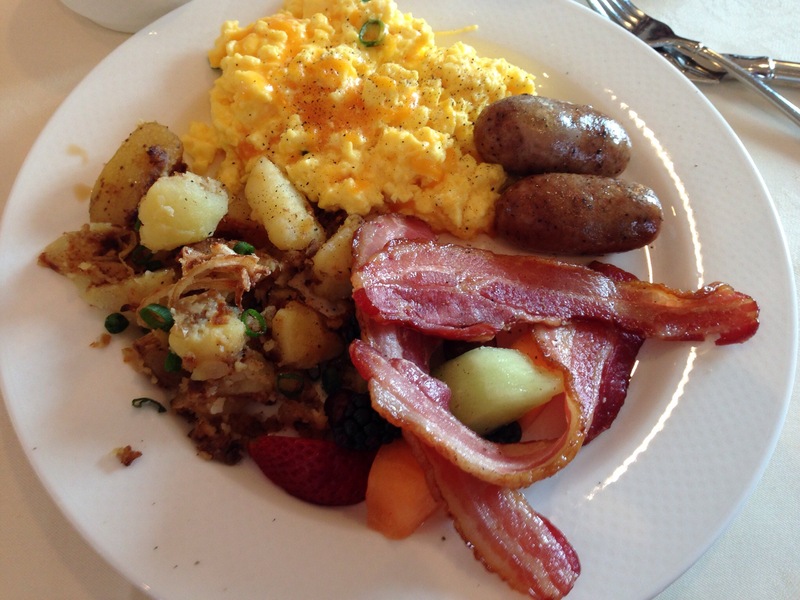 The brunch that was included with our race entry was awesome! I sat with some great people—-a guy from Red Deer and some local Calgarians. The food definitely hit the spot and held me over on my drive back to Lethbridge. Anyone reading this blog for the first time may think that I have always been this fast. Let me stress this—–up until April 2013, my best half marathon time was a 1:54 and change. Finding a plan, finding a motivation within….that’s what I needed. If you read my older posts you will find that I started this blog to honor my dad’s life, and to try and deal with some of the things I had yet to handle since his premature death at age 51 in 2004. I took the thing that caused me so much pain for so many years and found a way to ease that pain-through running, I have found myself. I am also becoming more of an athlete, more of someone who I never though I could be. But I know my dad always thought I could be it. And I know he is proud. Awesome job!!! And I thought you made up the name of the race! Lol. So excited for you Andrea. Congrats on your huge PR…..over two minutes is huge in those conditions! When is your next marathon? Thanks!!! My marathon is May 3rd in Vancouver BC. I took two days off this week to recoup my legs. Have a 15 miler tomorrow. The training schedule is really paying off! 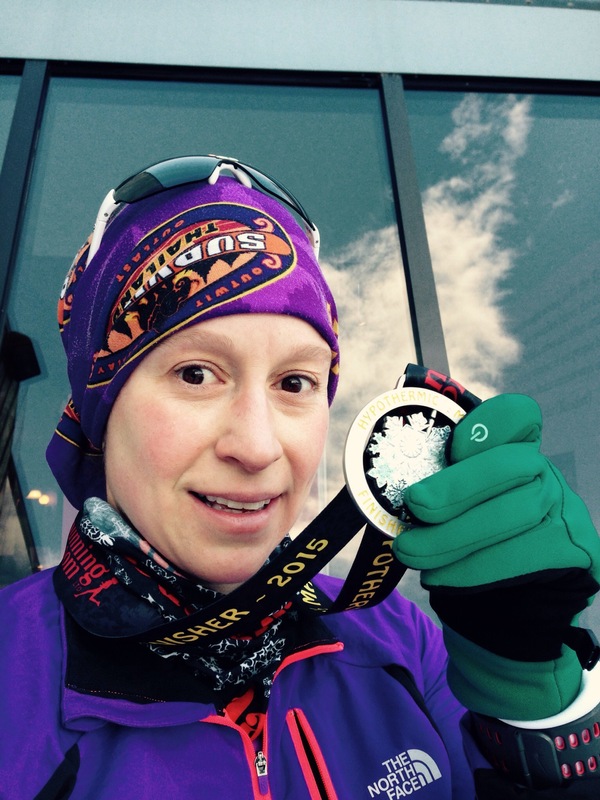 Pingback: Hypothermic Half 2016-Why? | Je Me Souviens-To Infinity & Beyond!